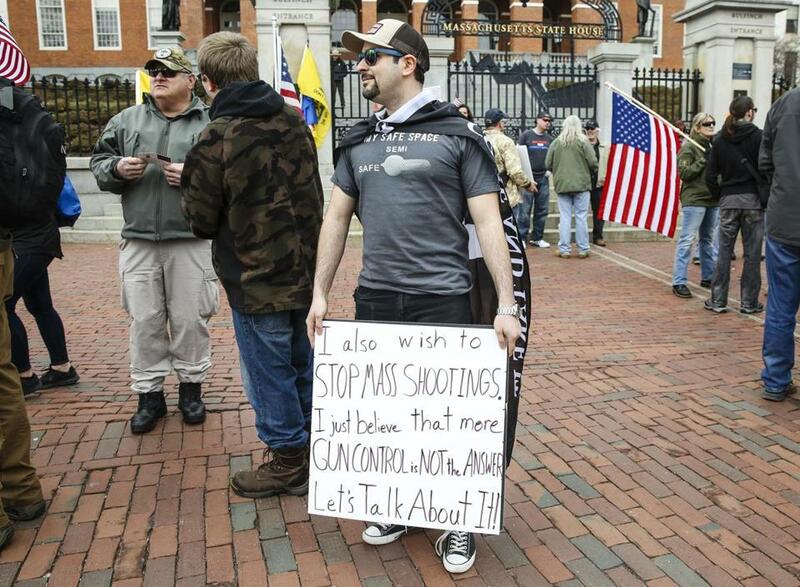 Daniel J. Gonzalez, 26, a graduate student at the Massachusetts Institute of Technology holds a sign during an assembly support gun rights on in front of the Massachusetts State House Saturday. About 75 supporters of the Second Amendment gathered on the steps of the Massachusetts State House Saturday in a show of solidarity less than a month after thousands marched in Boston and other cities to push for stricter gun laws. The vast majority of those who attended the 2 p.m. rally were “Three Percenters,” a national group named for the approximately 3 percent of colonists who took up arms to fight the British in the American Revolution. Stephen Fasshauer, 63, a member of the Massachusetts chapter of the American Patriot III% said he was there to protest the state’s 20-year ban on assault weapons, upheld by a federal judge earlier this month. “I’m looking forward to the Supreme Court issuing a decision based on the original intent [of the Second Amendment], and not having federal judges legislate from the bench,” he said. The rally was one of several held at state capitols across the country Saturday in response to the student-led marches calling for tougher gun control laws in the aftermath of the February shooting at a Parkland, Fla. high school that killed 17 people. The rally followed no set program, and some vented about their confusion on social media. “This apparent lack of advance organization may partially explain why we have 402 confirmed attending and the anti gun people have TENS OF THOUSANDS show up for their national rallies,” one wrote on the event’s Facebook page. With no sound system available, two speakers were forced to shout into the crowd as they spoke from the steps. After about two hours, the crowd dispersed. Daniel J. Gonzalez, a 26-year-old graduate student at the Massachusetts Institute of Technology, said he was pleased with his side’s turnout.